Workers are seen at the site of the first condominium tower at 801 South St., which is being built next to the former Honolulu Advertiser building. Developer Downtown Capital says all 410 units in the project’s second tower have been sold to Hawaii residents. The developer of the second affordable condominium tower being built on the site of the former Honolulu Advertiser building said Wednesday that all 410 units have been sold to Hawaii residents. Marshall Hung of Downtown Capital said that 93 percent of the 410 units in Building B of 801 South St. will be owner occupied. 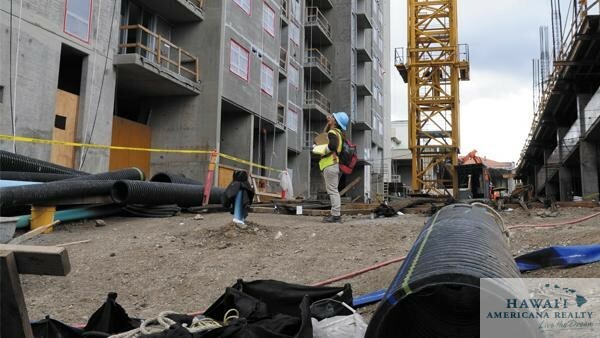 More than 80 percent qualified as workforce housing buyers, meaning that they earn less than 140 percent of the area median income for Honolulu, which is $134,120, according to the U.S. Department of Housing and Urban Development. Prices range from $350,000 for a one-bedroom unit to around $700,000 for a three-bedroom unit. Maintenance fees range from $255 to $360. Downtown Capital said that the buildings don’t have amenities such as pools and gyms, which kept the prices down, and that it received no government subsidies. The Hawaii Community Development Authority approved the project in December. On Wednesday, Downtown Capital addressed criticism that the area lacks the roads and infrastructure to support the project, saying that more than $200 million has been invested in the infrastructure in Kakaako since the 1980s. The company also said that it followed proper notification requirements for the project. The units in the second 801 South St. tower began selling in March. Construction is slated to begin before the end of the year. A state judge has halted construction of a recently sold-out planned Kakaako condominium tower after finding that two state agencies failed to follow state law protecting historic places and burials. The ruling by Circuit Court Judge Karl Sakamoto on Friday stops work on 801 South Street’s second phase known as Building B. The ruling also exposes another failure of the State Historic Preservation Division, an agency that is responsible for enforcing state historic preservation law but has not followed its rules in recent cases involving the city’s rail line and redevelopment at Kawaiaha’o Church. Sakamoto issued a preliminary injunction that halts construction primarily because he said an archaeological inventory survey should have been done on the tower site but was not. The judge made his decision in response to a lawsuit filed in March by owners of a neighboring tower, Royal Capitol Plaza, against the Hawaii Community Development Authority, the state agency regulating development in Kakaako. The 801 South Street project on the site of the former Honolulu Advertiser Building is currently under construction. More than 3,500 people have shown some type of interest in the affordable condominiums at the second building under construction at 801 South St. in Honolulu, according to the developer. 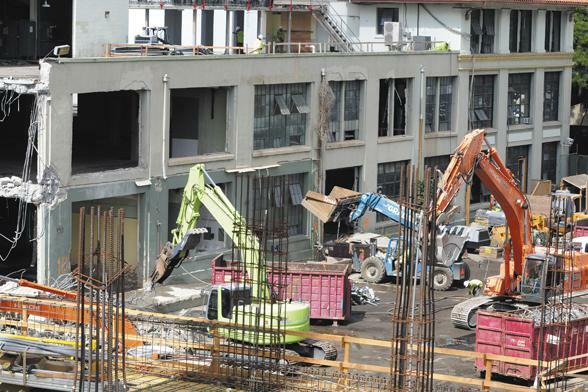 The units at the former Honolulu Advertiser Building site went on sale in March. 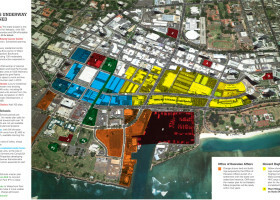 The project’s developer, Downtown Capital LLC., said that 85 percent of the buyers are families who are earning less than 140 percent of the area median income, which was required by the Hawaii Community Development Authority. All of the buyers are from Hawaii, Downtown Capital said. They were chosen through a lottery. A lottery for the first building at 801 South St. was held in March 2013. Maintenance fees will range from $255 for a one-bedroom unit to $360 for a three bedroom unit, Downtown Capital said. The state agency overseeing the redevelopment of the Honolulu neighborhood of Kakaako on Wednesday approved a second workforce housing condominium project on the site of the former Honolulu Advertiser building on a vote of 6-0 after hours of public testimony and discussions. The Hawaii Community Development Authority’s vote to approve the second phase of the 801 South St. project was not unanimous — one board member abstained from voting because he had to leave early and two others were excused. About 40 people had signed up to testify, while a host of others who didn’t sign up were given a chance to give their say once the people who had signed up finished testifying, said Lindsey Doi, spokeswoman for the HCDA. The HCDA board, amongst a standing-room only crowd, addressed concerns by some in the public regarding the affordability and other issues of the 410-unit project, which is being developed by Hawaii developer Marshall Hung’s Downtown Capital LLC. HCDA Executive Director Anthony Ching said that an affordability study recently done by some Kakaako residents on the project does not add up by pointing out that the interest rate that’s used in the study is not what the HCDA has used to analyze the project. The preliminary prices for the one- and two-bedroom units are between $360,000 and $575,000 with three bedroom units priced below $700,000. The second proposed tower, which would include an accompanying 10-story parking garage, is part of the 801 South St. project, whose first phase of 635 units is sold out. The 801 South St. project is expected to cost $400 million to develop and will create 350 construction jobs. 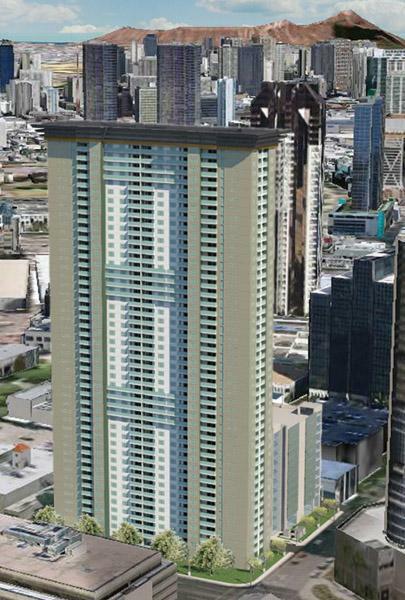 Hawaii agency to decide on second condo tower at 801 South St. The Hawaii Community Development Authority expects to make a decision on Wednesday regarding a Honolulu developer’s plan to build a second residential tower in Kakaako with an accompanying 10-story parking garage on the site of the former Honolulu Advertiser building, the state said Monday. The state agency that’s overseeing the redevelopment of Kakaako is holding a second public hearing on the permit application by Downtown Capital LLC, which is headed up by Hawaii developer Marshall Hung, on Wednesday at its office at 461 Cooke St., starting at 9 a.m. The workforce housing condominium, which would include some 400 units, is part of the 801 South St. project, which includes a first phase of 635 units that have sold out. Together, the two towers are expected to have a total of about just over 1,000 units. Kakaako residents want tower plan halved at the 801 South Street project. 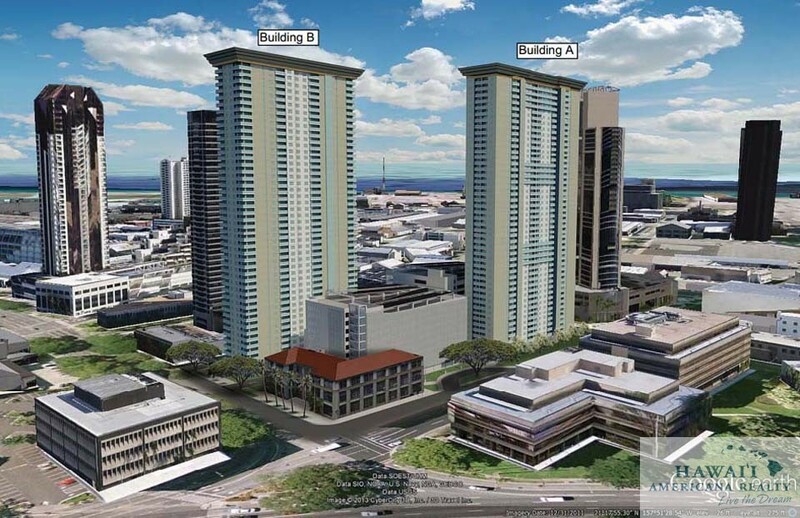 via @staradgomes Honolulu Star Advertiser…………..
One tower is OK but two towers are too much. That’s the view of a group of residents in Kaka­ako’s Royal Capital Plaza condominium tower, next door to the proposed site for two 400-foot towers called 801 South St.
Royal Capital residents have launched a campaign to try to stop the second of two towers proposed for 801 South, forming the group Kaka­‘ako Cares and staging protest rallies the last two Fridays in front of the project site at the Ewa end of Kapiolani Boulevard at South Street. On Wednesday the group is expected to argue against the tower plan at the first of two public hearings held by the Hawaii Community Development Authority, the state agency regulating development in Kaka­ako. The general idea for 801 South was announced a year ago, and HCDA approved a permit in December for the first tower, which began construction in May. Detailed plans for the second tower were publicized last month after project developer Downtown Capitol LLC, a firm led by local affordable-housing builder Marshall Hung, submitted a permit application to HCDA. This is the third time this year that residents of an existing high-rise condo in Kaka­ako have organized and opposed a planned tower project on an adjacent parcel. One instance involved Imperial Plaza residents opposing a project called 803 Wai­manu in which a developer sought to build closer to Imperial Plaza than permitted under HCDArules. In that case the agency rejected the plan. The second instance involved residents of One Waterfront Towers opposing a project called The Collection. HCDAapproved this plan, though the opposition group calling itself Kaka­‘ako United has appealed the agency’s decision. Complaints about residential density in Kaka­ako are only expected to increase as developers push ahead with plans to add more than 30 towers over the next decade or two in the area bounded by Ala Moana Boulevard and King, Pii­koi and Punchbowl streets. 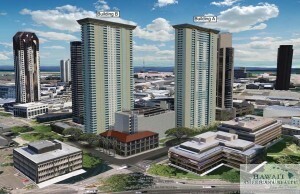 Jesse Allen, a real estate agent and spokes­man for Kaka­‘ako Cares, said in a statement that two towers and a pair of separate 100-foot-tall parking garages will overwhelm the 3-acre site that is also partially occupied by a historic building constructed in 1929 for The Hono­lulu Advertiser newspaper. “My neighbors of all ages, both kama­aina and newcomer, decided that was too much development for a scenic gateway to Kaka­ako and historically significant block,”Allen said. He also argued that proposed prices for some units in the second tower won’t qualify as “workforce” housing under an HCDArule that the developer is using to double the normal maximum density allowed on the site. The rule, adopted in 2011, allows twice as much density for projects that receive no government financial assistance and make at least 75 percent of units affordable to residents earning between 100 and 140 percent of Hono­lulu’s annual median income. 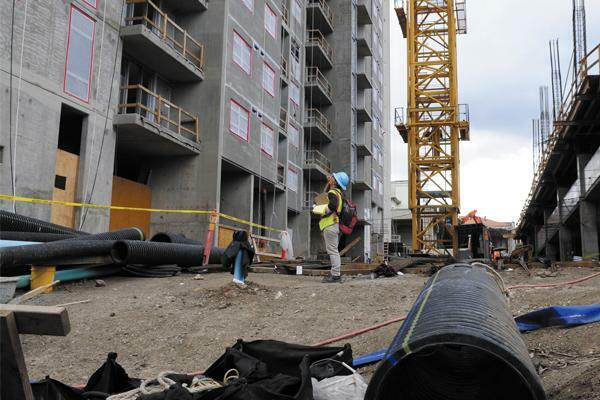 The workforce housing rule has been touted as a new tool to help produce moderate-priced housing in Hono­lulu, where housing prices consistently rank as the highest or almost highest among major cities. Hung has said all the units in 801 South’s first 635-unit tower and second 410-unit tower will be within HCDA’s workforce housing parameters. The income limit ranges depending on family size. For a single person the limit is $84,574. For a family of four the limit is $120,820. For a family of six the limit is $140,151. Units in 801 South’s first tower were priced from $250,000 to $550,000 for studios, one-bedroom and two-bedroom condos. The second tower is planned for larger units with one to three bedrooms priced from $360,000 to about $690,000. Of the 410 units planned in the second tower, 45 have three bedrooms and uppermost prices. Guidelines used by the Hawaii Housing Finance and Development Corp., a state agency that assists with affordable-housing development, say a roughly $700,000 home is affordable to a family of six earning about $140,000 based on a 5 percent down payment and an interest rate of 4.5 percent on a 30-year loan. Allen contends that prices in the second tower are too high for buyers earning a maximum 140 percent of Hono­lulu’s median income. Downtown Capital representatives dispute the opposition group’s contentions, saying that its project is for teachers and policemen and suggesting that Royal Capital residents only want to preserve their views. The developer said the need for moderate-priced homes on Oahu is overwhelming, and said about 6,000 prospective buyers picked up applications in March for its first tower, which is sold out. HCDA’s board will be considering several requests by Downtown Capital to deviate from agency rules, the biggest of which is to build a detached parking garage 107 feet high. The height limit for such structures is 45 feet. The agency allowed Downtown Capital to build a 102-foot parking garage next to its first tower. The developer said building a separate garage would save $10 million and was necessary to deliver units in the moderate price range. A decision by HCDAis slated to be made following a second public hearing scheduled for Dec. 4. HEARING ON TOWER AT 801 SOUTH ST.
>> When: Wednesday, 9 a.m.
Honolulu is accustomed to housing booms — especially for luxury condominiums in the urban core. But a workforce housing boom may now be forming. A developer has proposed a 217-unit workforce, or moderate-priced, condo tower in Kakaako on a roughly half-acre site now occupied by single-story industrial buildings. A developer is proposing to demolish the single-story industrial buildings on a half-acre site between Kawai­ahao and Waimanu streets and build a 250-foot condo tower. Pictured is L&L Transmission at 803 Wai­manu St.
MJF Development Corp., led by Franco Mola, is seeking a permit from the Hawaii Community Development Authority to develop the 27-story project, which would rise 250 feet. Mola’s project application was filed last month shortly before the sellout of a 635-unit workforce condo tower called 801 South St. on a site nearby that is slated to be further developed with a second tower containing 400 units. The Mola project and 801 South St. are products of a relatively new HCDA “workforce housing” rule giving developers extra density for buildings with at least 75 percent of units priced for buyers earning no more than 140 percent of Hono­lulu’s median income. The income limit translates to about $96,000 for a single person or $137,000 for a family of four. Other projects for workforce rentals in Kakaako are also in the pipeline, including the 204-unit Hale­kau­wila Place apartments that began construction earlier this year, the proposed 690 Pohu­kaina project calling for 804 apartments on state land, and 80 live/work lofts for artists. Those three projects propose rents that would be affordable to tenants earning 50 percent to 140 percent of the median income. HCDA, the state agency governing development in Kakaako, also requires that 20 percent of units in higher-priced condo tower projects be priced at the workforce level, and there are at least two such projects in the works. Chuck Wathen, an affordable-housing advocate and executive director of Hawaii Housing Alliance, isn’t surprised by the rising volume of moderate-priced housing being proposed in Kakaako. “We really need rentals, and … the supply of units for sale is almost nothing,” he said. Wathen predicts that Mola’s project, if it comes to market, will almost certainly sell out. “We are basically supply-constrained,” he said. Of all the workforce condo plans, 801 South St. is positioned to break ground first, in June. Mola’s project is subject to HCDA approval. The agency has scheduled two public hearings on the plan. The first hearing is slated for May 1 at 9 a.m. and will include a presentation by the developer. The agency will host a second public hearing June 5 at 9 a.m., after which a decision on the application is expected by the agency’s board. Both hearings will be held at HCDA offices at 461 Cooke St. 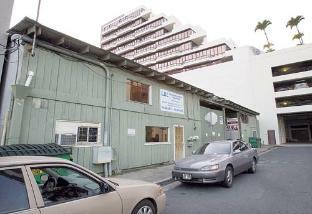 The property borders Kawai­ahao Street and the Ewa end of Wai­manu Street between the Imperial Plaza tower and a self-storage facility. A company named Action Development LLC, managed by Francine Summers and Byron Ho, is listed as the property’s owner. That firm bought the parcels in 2007 for $3.9 million, according to property records. Mola could not be reached for comment Tuesday, when HCDA announced the public hearing schedule. The developer is proposing a mix of units from studios with 372 square feet of living space to two-bedroom units with a little more than 600 square feet, according to application details. Unit prices were not specified. Mola, through companies including Coastal Rim Properties Inc., has been involved in development mainly in California and Hawaii, including the 176-unit affordable senior apartment building Kulana Hale in Hono­lulu. Coastal Rim’s website says Mola has overseen planning and construction of more than 4,300 homes. The developer previously had an option to buy the 801 South St. site, but that purchase fell through, and local affordable-housing developer Marshall Hung acquired the property and launched plans for two workforce housing towers.